Surprise, I’m posting again! I apologize for my hiatus; 2018 turned into the most difficult year of my life. Thankfully, we survived and are better for it. We treasure each day and are moving forward with renewed purpose and gratitude. So far winter has given us daily options to grapple with, from freezing rain and ice, to wind, and drifting feet of snow. This has not been a problem, as it gives us ample reasons to stay home and do what we enjoy: cooking, reading, writing and playing games (we love cribbage and dominoes); not to mention working steadily on soap production for the next market season. The good news is I’m making significant headway on my next cookbook: Twisted Basics: Rethinking Food. While during some research I came across a staggering statistic: 70% of Americans don’t cook. That’s right. Most Americans eat out at least 4 times a week. We heat up, microwave or assemble food; but cooking from scratch is becoming something of a novelty. I asked myself, “are we really that busy?” I couldn’t imagine not cooking regularly. For me, it’s my most sincere expression of love. I also started wondering if people understood what they were missing. The kitchen has always been the heart of the home; a place where intimacy takes place, both in the preparation of food and the sharing of it around our table. As I was contemplating this, I felt as though we’ve been sold a collective bill of goods. As we scramble to meet our financial needs, we are forgetting some of the fundamental, simple pleasures of life: cooking fresh food, with love, for our friends and family. Isn’t it time we break bread together? In medium bowl, combine the ricotta, pecorino, thyme and egg. Place 1/2 cup sauce in bottom of a 13 x 9 deep-dish lasagna pan; position 3 no-bake lasagna sheets evenly spaced. Spread ricotta mixture on top on each section. Then top each ricotta section with zucchini and carrot mixture; followed with one slice of provolone, cut in half for each section. Next, top each section with a no-bake lasagna sheet, 1/4 cup of sauce per sheet and repeat with ricotta mixture. Then top with chopped and drained spinach on each section, two 1/2 slices of provolone, and continue with lasagna sheets for each section. Sauce again, ricotta, zucchini and carrot mixture, provolone cheese and lasagna sheets. Sauce again, then sprinkle shredded mozzarella cheese on top. Cover with foil. Preheat oven to 375 degrees F. Bake for 30 minutes covered; 30 minutes uncovered. Let rest for 15 minutes before cutting into six servings. I’m always looking for inspiration in the kitchen. When it comes to regional cuisine, a classic dish can often inspire me to bend the rules. 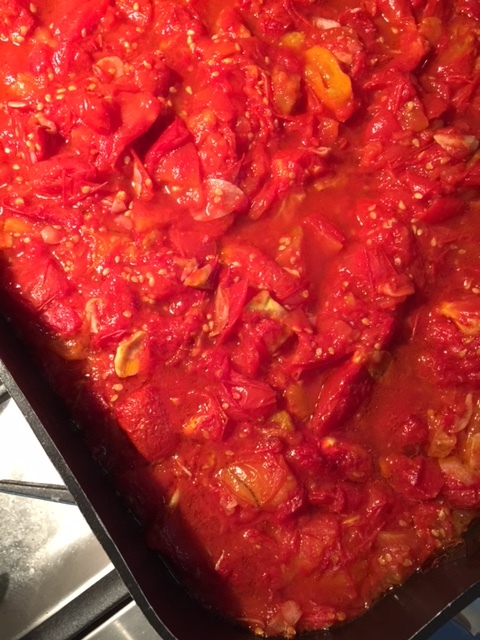 For example, I love Italian Chicken Cacciatore, with its tomatoes, garlic, onions and capers. The challenge for me was, its traditional breading always sat a little heavy. Why not lighten it up, leave the breading off, use Moroccan spices, chickpeas and feta? The result? Something similar, yet completely different in tone. Vegetarian? Leave out the chicken completely and replace it with roasted butternut squash or zucchini. The real focus is what the regional seasoning does in relation to everything else. The Moroccan or North African seasoning called Ras El Hanout (which means: “top of the shop”) can contain anywhere from 10-100 different spices. I’ve included my version of this savory spice combination. I highly recommend making it yourself, as you can easily control the heat. I’m hooked on it and keep finding different ways to use it. You can also find it manufactured by several companies like McCormick or the Teeny Tiny Spice Company. Served over rice, couscous or quinoa, with a simple side salad of mixed greens tossed with vinaigrette and you have a dinner that’s comes together quickly and is sure to please. Mix all the spices together and store in airtight container. Preheat oven to 375 F. Melt butter and olive oil in 12-inch skillet over medium heat. Saute garlic and onion until soft, about 4-5 minutes. Add Ras El Hanout and simmer an additional 2 minutes. Add crushed tomatoes and stir to combine. Take off heat. Spoon about a 1/2 cup of the sauce into a 8 x 8 casserole dish. Place chicken thighs on top of sauce. Sprinkle chickpeas around chicken. Spoon the rest of the sauce over the chicken. Sprinkle feta over sauce. Bake uncovered for 45-50 minutes, or until bubbly and chicken thighs are done. 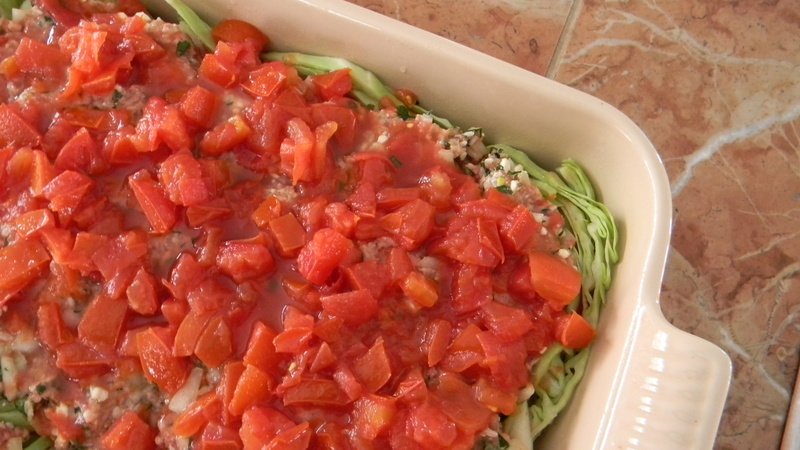 Remove from oven and sprinkle with minced parsley. Serve over rice, couscous or quinoa. This just seems like the right time to re-blog this post, since we are at the height of tomato season! After making a “double” batch of roasted sauce today, the yield was 4 pints of tomato stock (I use this for soups or risotto) 8 pints and 3 quarts of rich tomato lusciousness! Often times, during the growing season fatigue sets in at the end of the day and preparing a meal takes a back seat. For the past two farm seasons, I’ve been in the process of healing from a major intestinal bleed-out and have not be able to actively weed or harvest vegetables along side Val and our farm hand Zac. After two days at market, it literally takes the next four or five to rest and recover. Val my ever-ready bunny continues to be the mover and shaker at Brickyard Farms. She deals with the additional workload without complaint, always upbeat and positive. My “job” is to keep up with the bookkeeping, marketing and prepare a decent meal. I’m embarrassed to admit in the past I have typically approached meal planning with what do I feel like cooking? Rather than, what do we have and how can I use it creatively? It has taken time to really grow into a sense of place on our farm. That left over feeling of entitlement from my previous life sometimes blocks recognizing the incredible abundance we have here. With 5.5 acres of chemical-free vegetables and easy access to local cheese and meat; why would I choose to cook anything else? So my current mission is to create meals using only the vegetables that we grow before anything else is considered. I allow myself a wide array of condiments and spices, but the foundation comes from the farm. 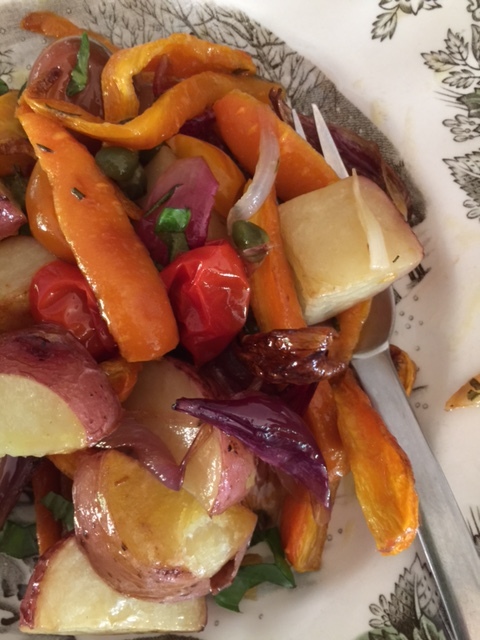 This week there are carrots, potatoes and tomatoes for starters, so I opted for a roasted concoction inspired by Yotam Ottolenghi. It was the first time I had added a dressing to warm veggies. The result made me weep with the realization that there is no lack of anything, only an overflowing abundance. Warm out of the oven ready to be tossed with the dressing. Preheat oven to 375 F degrees. Place the onions and carrots in a large bowl and add the olive oil, thyme, rosemary, garlic, 1 tsp salt and a few grinds of fresh black pepper. Toss well and spread out on a large rimmed baking sheet. Roast for 20 minutes. While the onions and carrots are roasting, prepare the potatoes. Add the potatoes to the pan and toss to coat. Return to the oven and roast for an additional 40-50 minutes. When the vegetables are cooked through and have taken on a golden color, stir in the halved tomatoes. Roast for an additional 10 minutes. Meanwhile, whisk together the lemon juice, capers, maple syrup, mustard and 2 Tbsp of olive oil. Adjust seasoning with salt and freshly ground black pepper. 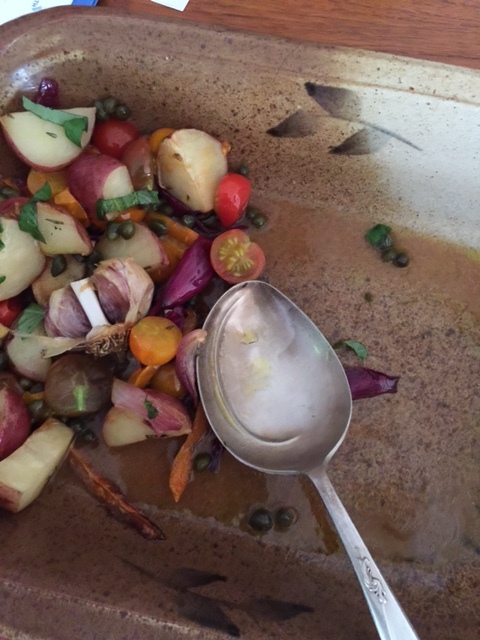 Pour the dressing over the vegetables as soon as you take them out of the oven. Remove head of garlic. 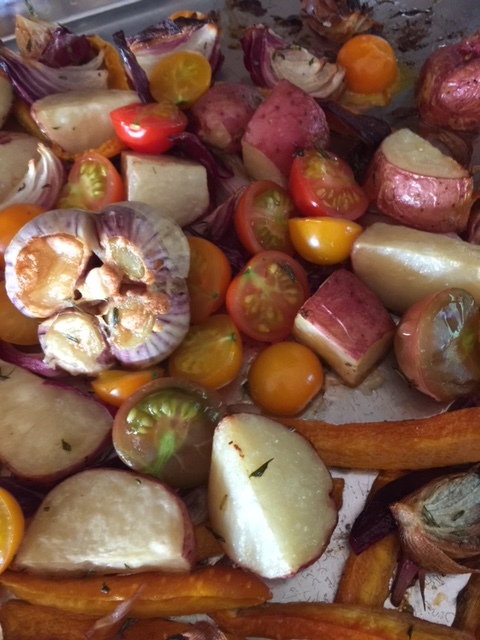 Place roasted vegetables in decorative bowl and sprinkle with coarse salt. Place garlic head on top. When serving break up head and squeeze garlic paste on each serving. Pass the Kleenex. I love cabbage rolls. My mother-in-law Elsa made them for me the first time in the early 80’s. she mixed beef and pork together with onions and rice, placed them in cabbage leaves and tied them with thread. She called this peasant-food. Her son John and I called it heaven. The first time I tried making cabbage rolls I was surprise just how bad I was at getting the leaves separated from the head in one piece. I kept saying, “It can’t be that hard!” I decided to get out of the box and approach it differently. Why not turn it into a casserole I thought? It would be less time-consuming and we could enjoy it more often. While I was getting out of the box, I decided to use ground lamb, different spices and feta for a different take on it completely. 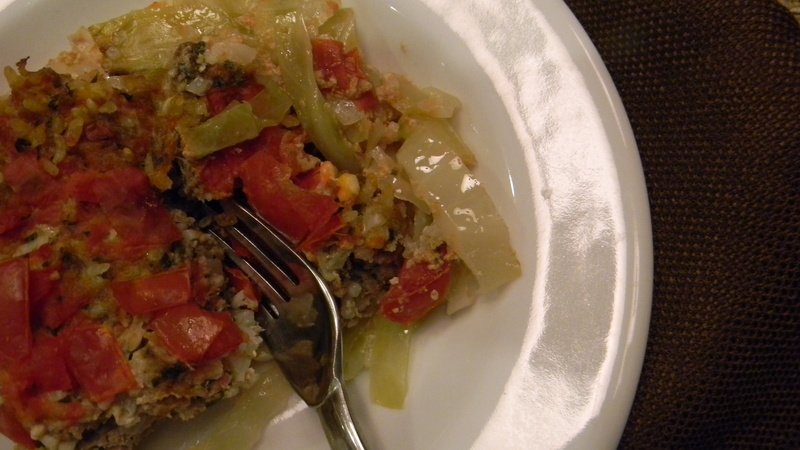 Doing the cabbage ‘rolls’ as a casserole allowed me to follow my own whimsy. 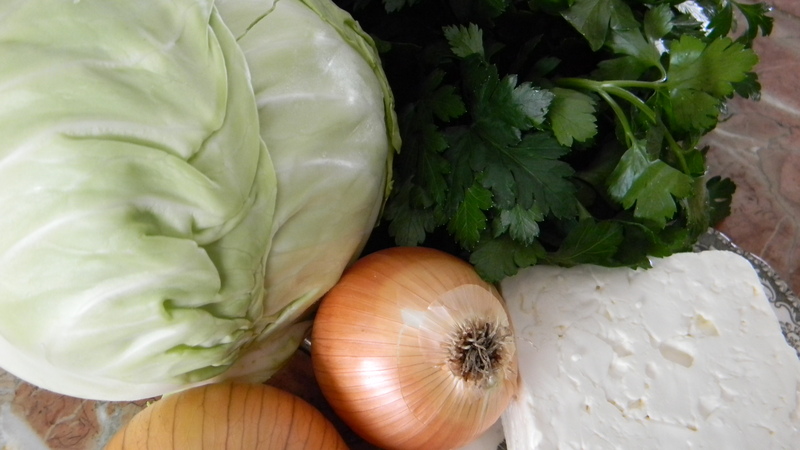 I could shake it up a bit with non-traditional spices and be able to enjoy more cabbage in the process. Preheat oven to 400 degrees F. Grease a 13×9 inch casserole dish with ghee. 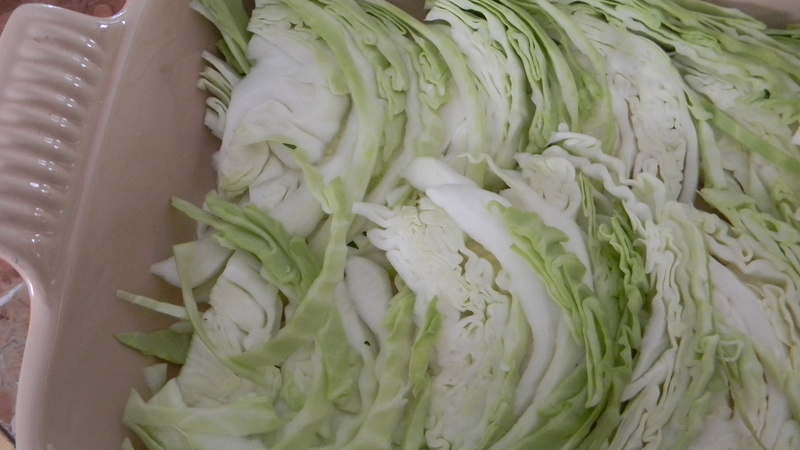 Cut cabbage in half, core, then slice in 1/2 inch wedges. Place the wedges in casserole dish so they overlap each other in two rows. In a large bowl, use your hand to combine the lamb, onion, egg, rice, parsley, oregano, lemon juice, feta, cumin, fennel, salt and pepper. Place mixture on top of cabbage, leaving a 1 inch space round the sides of the casserole so that the cabbage shows through.